Canberra, Australia's national capital and the home of its Federal Government, is an entirely purpose-built, planned city, designed by Walter Burley Griffin. Parliament House and the High Court of Australia as well as many federal government departments and agencies, plus associated businesses and organisations are in Canberra. As Australia's capital, Canberra is also the site of many national social and cultural institutions and buildings, including the Australian War Memorial, National Gallery of Australia, National Museum of Australia and the National Library of Australia. Canberra is in the northern part of the Australian Capital Territory, 300 km southwest of Sydney and 650 km northeast of Melbourne by road. Canberra has a population of approximately 308,700. Canberra is also famous for the Floriade Festival each Spring at Canberra's Commonwealth Park on the northern shores of Lake Burley Griffin. 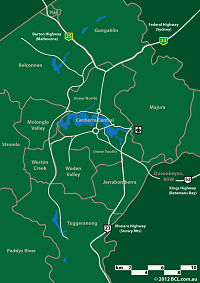 Canberra is made up of several districts: Belconnen (north west, Gungahlin (north), Canberra Central comprising North Canberra (Inner North) and Canberra – Inner South, Kowen, Molonglo Valley, Woden Valley (south), Weston Creek (south west) and Tuggeranong (far south). Molonglo Valley is a new district which will be to the north of Weston Creek and to the south of Belconnen. What's On Events and things to do including cinemas, theatres, museums and historic attractions, general attractions and festivals around Canberra and the ACT.